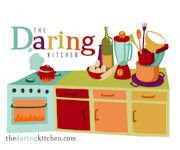 Blog-checking lines: The Daring Bakers’ February 2012 host was – Lis! Lis stepped in last minute and challenged us to create a quick bread we could call our own. She supplied us with a base recipe and shared some recipes she loves from various websites and encouraged us to build upon them and create new flavor profiles. 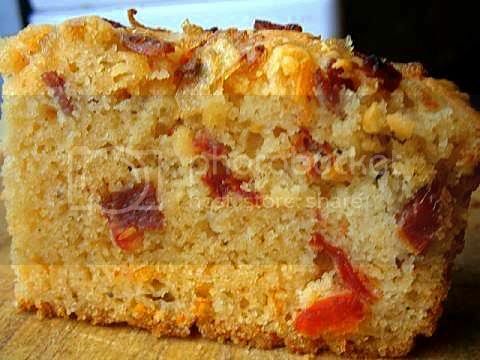 Recipe Source: The basic quick bread recipe is from Sara Schewe. 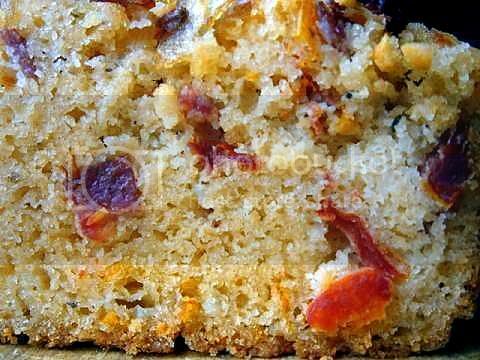 The prune bread recipe was my Aunty Ann’s recipe. The Meyer Lemon Loaf and Green Onion, Cheddar & Asiago Beer Batter Bread were adapted from Recipe Girl (http://www.recipegirl.com/2008/08/13/meyer-lemon-loaf/ & http://www.recipegirl.com/2007/05/30/cheddar-chive-beer-bread/ ). The Pumpkin Bread with Maple Cream Cheese Filling was adapted from Dana Ramsey’s recipe located on Just a Pinch Recipe Club. I really liked this challenge so many possibilities for the flavourings I made seven versions. 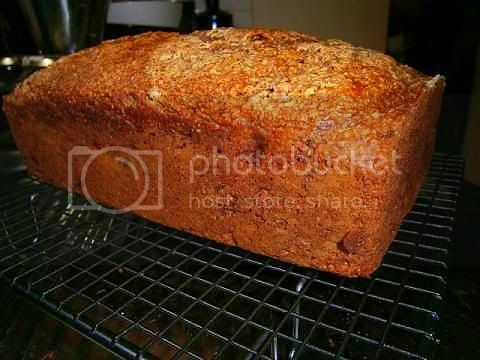 I make banana bread at least once a week (an oversupply of bananas and it's super easy and quick to make and most of my friends and family love it) so I have developed a good feel for making it any way I want, below are some general guidelines on how to manipulate the ingredients and what techniques to use to obtain the banana loaf you want. 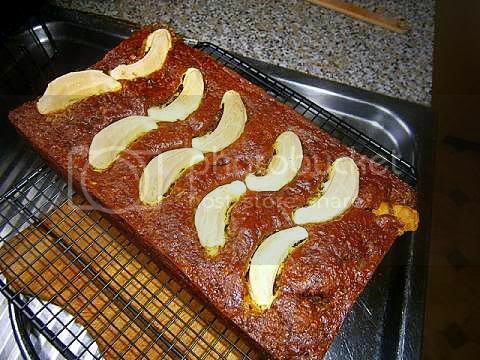 For this challenge I made a brunt butter, brown sugar, coconut cream, roasted banana loaf. I roasted 4 bananas until they were like syrup I combined this with brunt (actually well browned) butter, brown sugar I used coconut cream for the liquid soured with some lime juice. 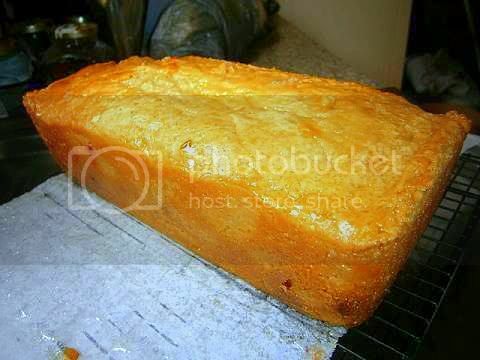 I wanted a dense moist bread-like loaf, so I used the two bowl method to make the quick bread. 1. Low fat version use the lowest amounts of sugar, butter (you can use apple sauce instead) and lite sour cream (no eggs), stir the sugar and butter together until well mixed but still grainy add the other wet ingredients, sift the dry ingredients in another bowl, combine gently. 3. 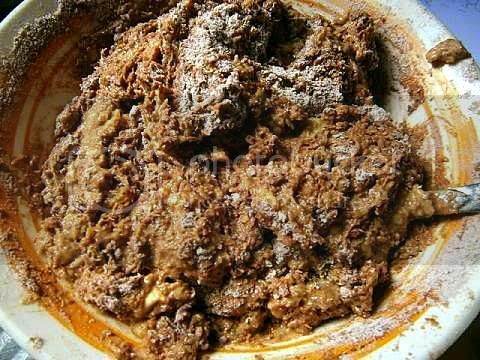 Extreme fat version use the highest amount of sugar, butter and use 2 eggs (no sour cream), cream the sugar and butter until pale and fluffy, add eggs one at time beating well until incorporated add all the other wet ingredients mix well, add the sifted dry ingredients, combine gently. 1. 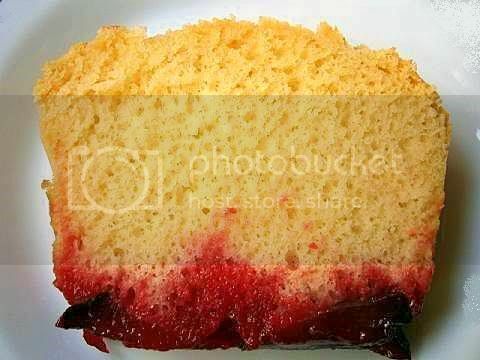 Equal ratio batter: This batter has a dry:liquid ratio of 1:1. Which gives a very moist and dense loaf. 3. Stiff ratio batter: This “batter” has a dry:liquid ratio of 7:1 This batter will result in a very light and fluffy baked good. 1. 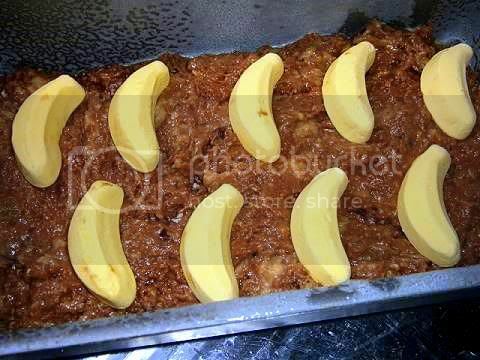 Roast the bananas in their skins in a preheated moderate 350°F/180°C/gas mark 4 oven for 15-20 minutes until black. 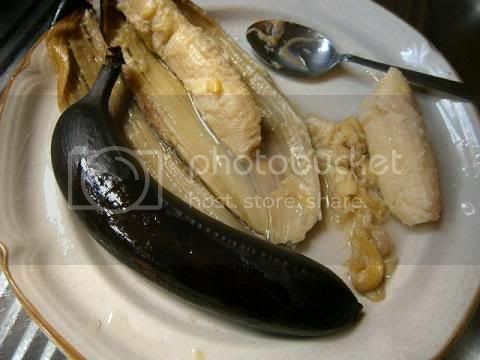 Carefully remove banana flesh from the skins then mash well with any liquid released from the banana. Add the kecap manis and/or cayenne pepper if using mix until well combined. Cool and reserve. 2. If you are using browned butter gently heat the butter in a saucepan until it browns to desired colour. The darker the colour the deeper the flavour. Set aside until firm. 3. 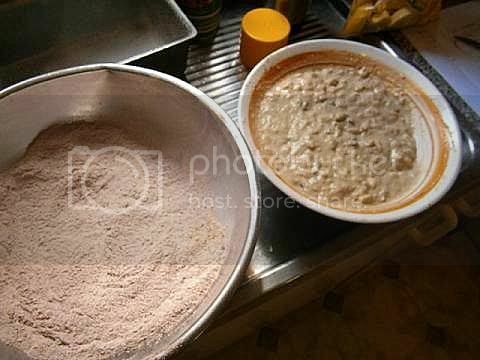 In one bowl sift the flour, baking powder, baking soda and cinnamon (and if using the salt, cocoa powder, ground cloves or instant coffee). 4. In another bowl using a wooden spoon or a plastic spatula lightly cream the sugar and butter together (about 1 minute) this will produce a bread-like loaf (if you use a mixer to cream [about 5 minutes] the sugar and butter until pale and fluffy the final loaf will be light textured and the crumb very cake-like), add the egg(s) one at time beating each time until well incorporated add the roasted banana mash, sour cream, vanilla extract and any additions. Mix until well combined. 6. 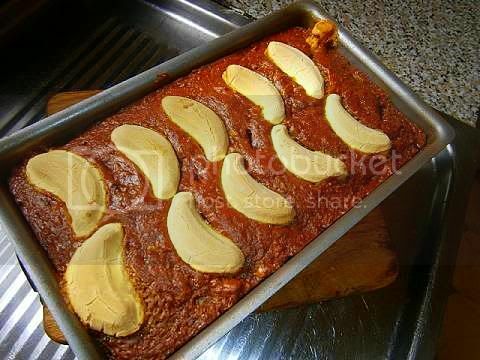 Spoon the batter into a greased large loaf [23cmx13cmx7cm (2litre)/9”x5”x3”(4.5 pints)] pan, carefully level the top. (The loaf pan should be a little under 3/4 full, it will rise to the top of the pan when baked). Decorate with banana sweets if desired. 7. Bake in a preheated moderate oven 325°F/160°C/gas mark 3 for 60-70 minutes or until a skewer comes out clean. (Check at 50 minutes). Muffins take about 20-30 minutes (check at 15 minutes). 8. 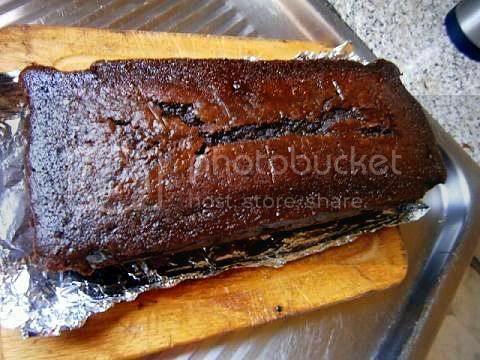 Leave in pan until warm (about 15 minutes) remove to wire rack cool to room temperature, cover in foil then plastic, refrigerate overnight. 9. This banana bread improves with age. The bread will store on the counter for three days if well covered and about ten days in the fridge. If you are a follower of the “ratio” cookbook the ratio by weight for baking quick bread is 2 parts flour: 2 parts liquid: 1 part egg: 1 part fat. 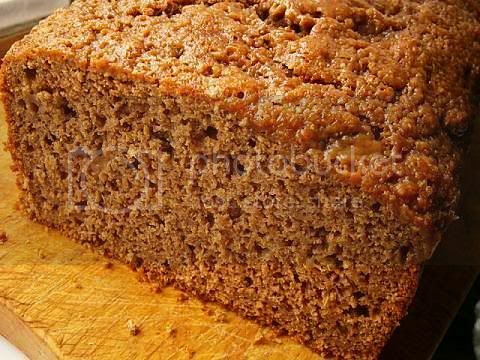 To fill a 9” x 5” (23cm x 13cm) loaf pan, you will need 240 grams of flour, 240 grams of liquid of any kind, 120 grams egg (2 of them) or egg substitute & 120 grams of fats. This ratio also works for making muffins. By volume you will need 1¾ cup flour, 1 cup liquid, 2 eggs, ½ cup fat (plus 2 teaspoons baking powder and about 1/2 cup of sugar plus additions). I needed a really strongly flavoured quick bread, I followed the basic savoury recipe, 2 cups soft self-raising "OO" flour and 1/2 teaspoon baking soda with these additions 1/4 cup chopped sun-dried tomatoes (with 2 tablespoons of the oil in the jar), 2 tablespoons dried Italian herbs, 1/4 cup crumbled blue cheese, 3/4 cup sour cream, 1 egg, one small chopped onion fried with one chopped spicy sausage and 1/4 cup high quality olive oil, I used 3 tablespoons of the fried onion and spicy sausage as a topping. When I was mixing the batter I could see the dough expanding, I spooned it into the loaf pan and baked it at moderate 325F/165C/gas mark 3 for 40 minutes. The aroma from the loaf was so good it smelt like a pizza baking. I was really pleased with the look of the loaf. The cut loaf was so yummy it had a thin crisp crust with a soft tender crumb choke full of flavour! 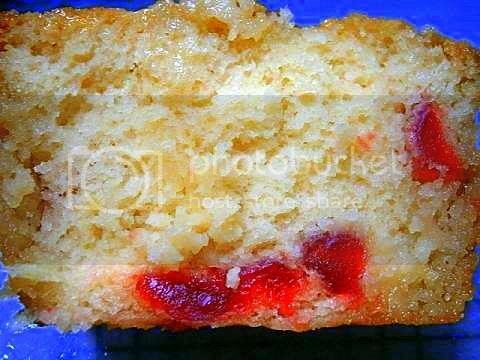 My favourite flavour profile for quick bread is cherry and almond, I used 1 cup almond meal, 1 cup of very fine semolina (soaked in some almond milk), 4 tablespoons gluten flour, 1 cup chopped cherries, 2 eggs, 1/4 cup vanilla sugar, 4 tablespoons rice bran oil, 1 cup sour cream, 2 teaspoons of natural almond extract, 1 teaspoon of cherry extract. I used 1 cup of sugar syrup to soak the cake after it was baked. This cake took almost two hours to bake at the recommend temperature! It is best to refrigerate the bread for a day before serving. The crust was thin, crisp and sweet while the crumb was soft tender and very tasty one of my better examples of my favourite cake. 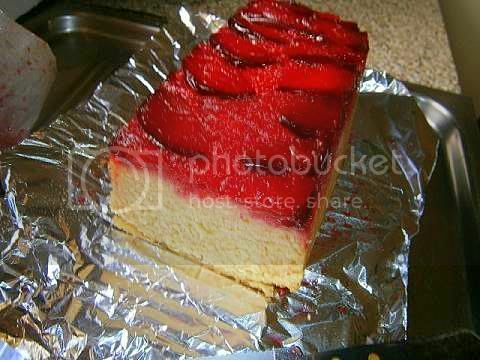 It is such a pretty cake and the tasty is luscious. I made this loaf a couple of days ago, I wanted to share how the crumb improves with some aging. After storing in the fridge cover in foil and plastic the loaf cuts cleanly and the density of the crumb is firm, so much better after a rest. 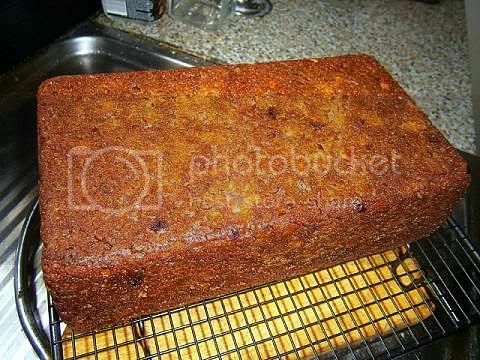 I used 1 cup of roasted parsnips and 1/2 cup of pureed prunes as the moisture content of the loaf. A really tasty and unusual flavour combination. The local gourmet fruit and veggie shop had cute little blood plums on special ($2/kg about $1/lb) so I thought I would make an upside down loaf with them. 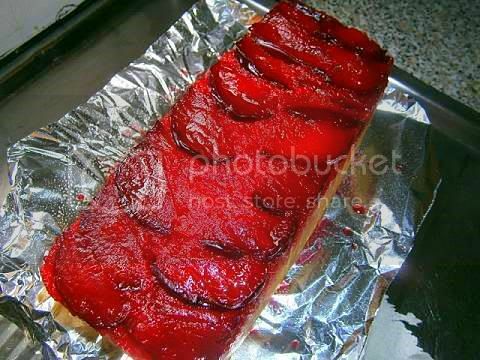 I sliced up four plums and laid them out decoratively on the base of a parchment paper lined loaf tin, then I made some boozy plum sugar syrup (¼ cup white sugar, 2 tablespoons plum brandy and 2 tablespoons blood plum juice simmered until thick and glossy) and poured that over the sliced plums then I made up the quick bread batter; the dry ingredients were 2 cups of soft “OO” flour sifted with 2 teaspoons of baking powder, ½ teaspoon baking soda and ½ teaspoon salt, the wet ingredients were ¾ cup lite sour cream, 2 eggs, 2 tablespoons non-flavoured oil. 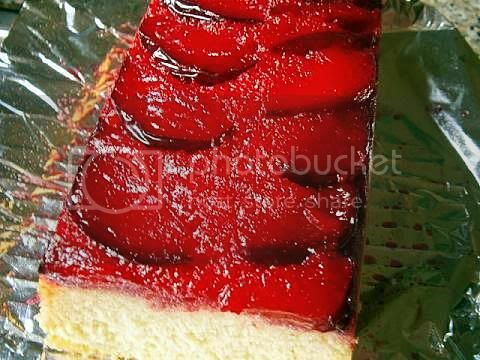 ½ cup vanilla sugar and 2 tablespoons of plum brandy. I used the two bowl method to combine the wet into the dry. I baked the loaf for 60 minutes at moderate 325ºF/165°C/gas mark 3. Then I cooled the loaf in the pan then I un-moulded the loaf. I was very very happy with the look of the topping it was so neon bright with a lovely red transparency. 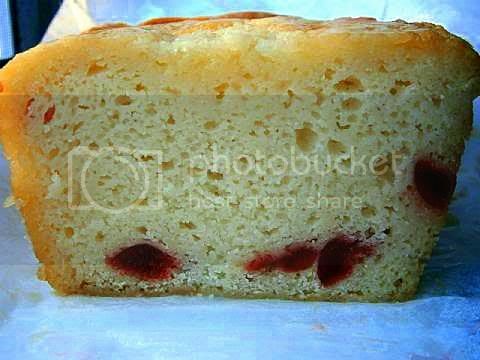 The loaf was superbly flavoursome the brandy taste was mellow and combined well with the blood plum flavour overall a nice looking treat for the afternoon and not much harder than the normal quick bread recipe (i.e. without the fruit topping). You can intensify the flavour of chocolate in a recipe by using a combination of techniques. The easiest is to use a combination of melted unsweetened (not dark) chocolate and cocoa powder which has a much stronger chocolate flavour than each individual ingredient tasted separately. Using espresso coffee or vanilla or chilli or kecap manis (used separately or in combination) greatly enhances the taste of the flavour compounds found in chocolate. Also steeping the cocoa powder in boiling water intensifies the taste of chocolate. 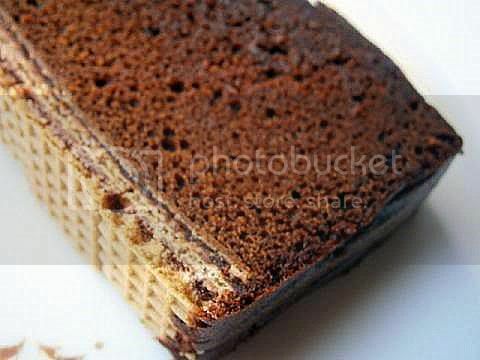 3. chocolate wafers to form an "upside down layer" (so when the bread is turned out the wafer layer becomes the base). I used the creaming method to make the bread. You can tell you have a strong chocolate taste when there is a "reddish" hue to the chocolate colour in the cake which shows that the flavour compounds have been fully extracted from the cocoa. I really like the simple elegant look of this treat. I thought I would do flavoured popovers as an experiment, I used the recipe that Renata linked to and substituted the cow's milk with coconut cream and used some home-made sour cherry extract also I accidentally used my 5% cake flour which I don't think was the correct choice for this recipe. They smelt wonderful while baking. I think I will have to do them again since the coconut cream made the batter too heavy for the popovers to rise correctly. Even if they sunk once out of the oven they tasted delicious. I think I will use coconut milk for my next batch and see if that will correct the heaviness of the batter. I made another batch of popovers using coconut milk and less cherry extract they worked out beautifully they rose about three times in height and had one large central hole in the popover perfect for filling with some lovely flavoursome morsel. See this recipe but replace the milk with coconut milk and 1 tablespoon of cherry extract. Also I baked them in a preheated very hot oven 450F for 15 mins and then 400F for 20 mins. I used 1/2 cup aluminium baking pans filled about 3/4 with the rested (30 mins) batter. 1. Place a small amount of oil in each popover baking pan. Place pans onto a baking sheet. 2. Preheat oven with the baking pans on a baking sheet to very hot 450F/230C. 3. Mix the flour, salt and sugar together in a large bowl. 5. Rest the batter on counter for at least 15 mins (an hour is best). Do not stir again. DO NOT refrigerate the batter. 6. Quickly remove the baking sheet and pour the batter into each pan about 3/4 full. The batter should sputter in the oil. Return to oven. 7. Bake in the preheated very hot 450F/230C oven for 15 min then lower the heat to hot 400F/200C and bake for a further 20-25 mins until risen and well coloured. DO NOT OPEN the oven during this time. 8. 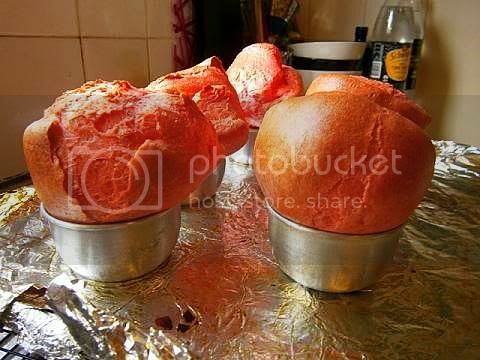 Remove from the oven and pierce a small hole into the side of the popover this allows steam to escape return the popover to the cooling oven to dry out completely which stops the popover from collapsing. Well, if one wants to learn the secrets of quick breads, this is the place to come! I loved all your creations, and all your enthusiasm along the way. I love your pink popovers and I'm glad that they turned out so perfect on the second try. Actually, they look like giant popcorns, don't they? Super great work on the challenge and thanks so much for sharing all your expertise with the group, as always! I just had a yogurt and thought I was content. Now I CRAVE some bread. That's what I get for viewing your post! As always, coming here is very inspiring and informative. Once again you have gone Above and Beyond Audax - you've reminded me about Upside Down Cakes and inspired me to give Popovers a try - not something I've seen here in NZ although people do make Yorkshire puddings to go with Roast Beef and they are made using a similar process. 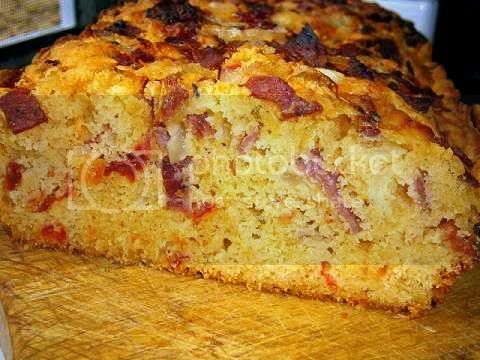 All your quick breads are stunning !I love it!! Thank you so much Audax for your nice comment and your kind words !! Beautiful loaves! I love your different flavour combinations. 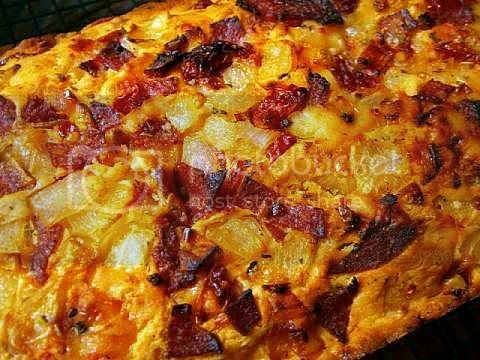 I will be trying your pizza bread. Unbelievable ! 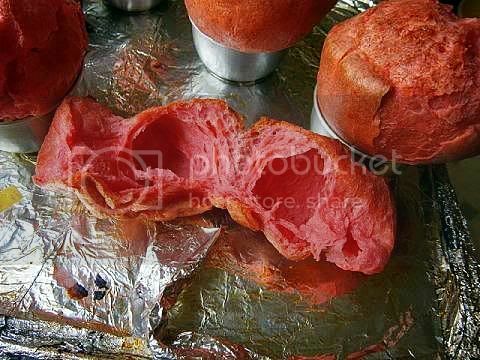 I love all those flavour, the blood plums, the chocolate excess & those popovers !! My popovers are curling up in the darkest corner of the room. There are so many of those breads I just can't wait to try. Seven versions?! 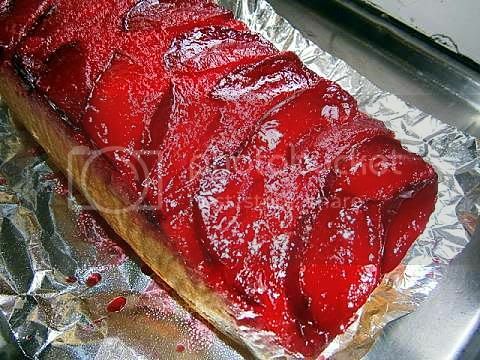 You are amazing :-) I want to try upside down blood plum loaf. Interesting recipes! My favourite's the Italian pizza loaf! wow so many different types!! 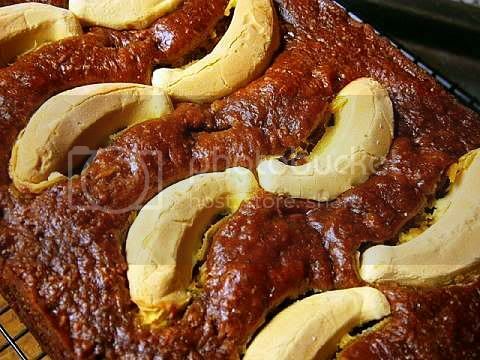 I love the sweeties on your banana cake... they make it so fun! 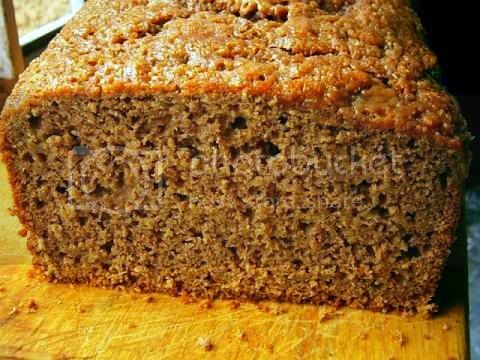 Banana cake is always good, i was very tempted to follow that route myself but instead went for gingerbread! Wow! Once again you've knocked this one out of the park. Great creations - especially the cherry popovers. Your breads look fantastic, specially loved the chocolate loaf and the pizza loaf! 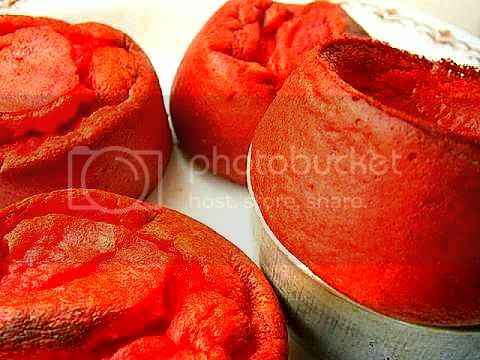 Though I love to bake yeasted breads, I wouldn't mind having these quick breads on my table (and tummy!) in much lesser time! Am certainly going to try these, thanks a lot! Thank you so much for all your wonderfull tips and recipes for this challenge. Wow, you really experimented with this recipe! 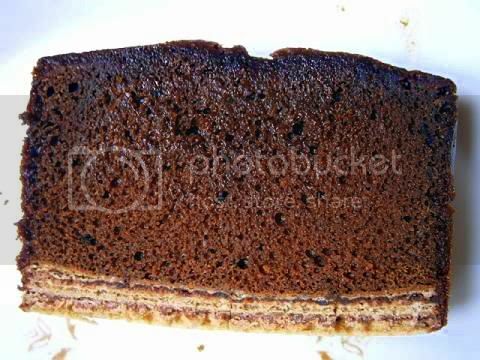 I love the wafers on the bottom of the chocolate loaf. Wonderful Creations!!!! So many delicious Quick Cakes! 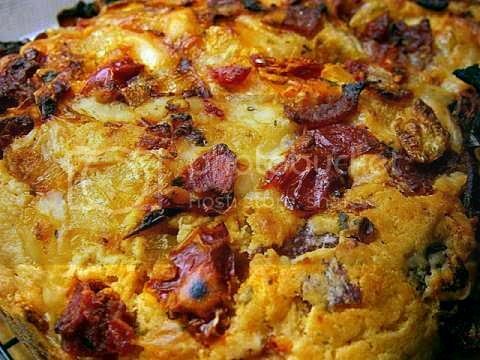 Love your Quick Italian pizza loaf with sun-dried tomato and blue cheese, Yummy!!! And your Popovers sound delicious. Wow, wow, wow - so many amazing flavour combinations and ideas! 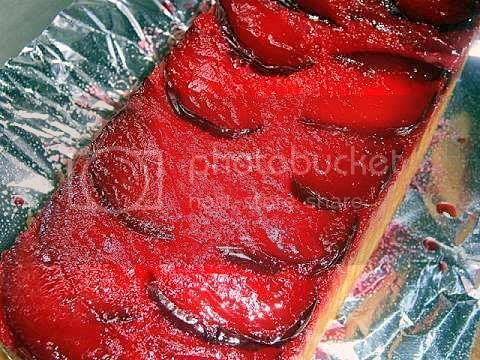 Love the banana sweets on top of the cake, and the upside down plums - how stunning! 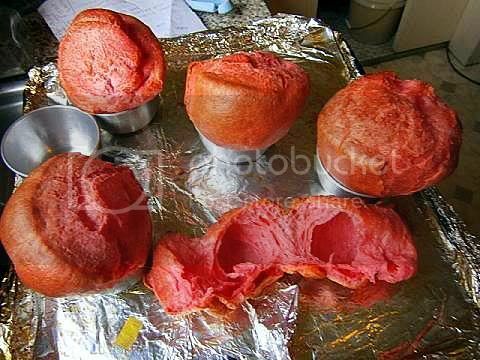 The cheery coconut milk popovers sound delicious too - I have some raspberry cordial in the cupboard, I make have to give something similar a shot! WOW. That's about all I can say, Aud! You are so creative!! 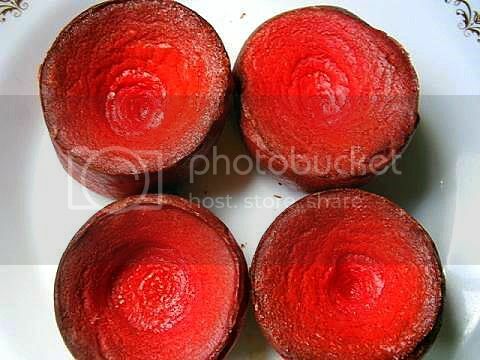 I think the cherry pop-overs look cool! Thanks so much for sharing all your knowledge with us! So many - you must have lots of friends to be able to use all of those. Not sure which is my favorite - cherry almond, plum upside-down they all look fantastic. That chocolate looks especially intense - you used every trick there is for that chocolate flavor. I had heard of most of those but have never heard of using kecap manis before. I don't even know where to begin! First, the red popovers are crazy cool. I don't even care that the first batch didn't rise so much, they still look great (even though your 2nd batch is perfect). 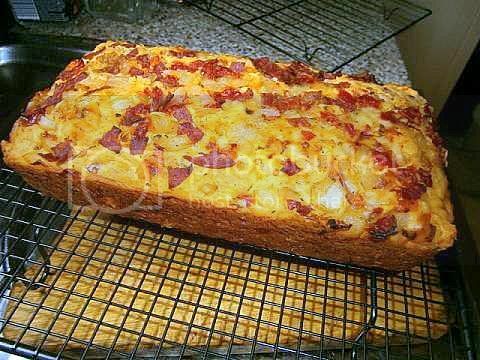 Everyone is raving about the pizza loaf so I must add that to my own list. The upside down plum version is beautiful look at and last but not least, I love the chocolate wafers on the bottom of the chocolate loaf. Nice touch! As always, fantastic! I am enthralled with your intense chocolate bread, love the wafer bottom! This is quite the collection of deliciousness! Great job (as always) on the DB challenge. Audax I am always in awe how many tries you do a recipe! Everything looks amazing! You are always such an inspiration Audax! And a great source for all the information that one needs to do a challenge. Great work as always on the challenges! Thanks for stopping into my blog earlier Audax. Since you posted the picture of your pizza bread, I've been meaning to make it. Not sure when, but when I do, I'll let you know how the fam. likes it. Wow, quite the variety you were able to bake up! Nice job on the challenge! So many amazing flavors! I think the roasted banana one intrigues me the most, but they're all so creative. I need to try popovers sometime. Excellent work, Audax! As always Audux you have outdone yourself with this daring bakers challenge! I absolutely love the sound of the italian herb loaf and will have to try that soon! Wafers at the bottom of the chocolate loaf is a lovely idea - and those second popovers are certainly popped! 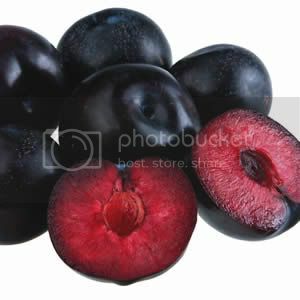 your plum quickbread is SO colourful! love it. And so many creations. amazing and inspiring as always! Your breads are fantastic, great job! I love your popovers and the upside down plum loaf is just stunning! OMG, Aud..your cherry cream popovers are SPECTACULAR - crazy, high and poofy - like I strived for. I have to make them..the color is just gorgeous. Now, if I get into every one of your quick breads, I'll be here forever. They're ALL ones I'd love to try..the texture, colors, flavor combos etc. Bravo on yet another awesome challenge you took to levels beyond fantastic!! WOW Audax your popovers are amazing! What a rise! 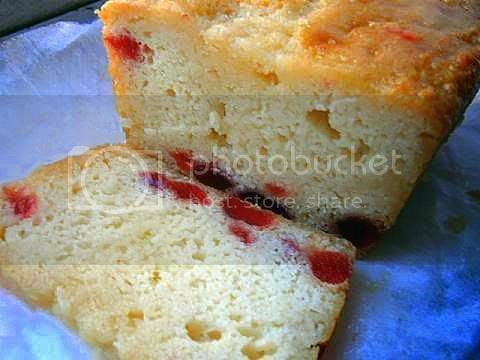 But my favourite is the Cherry Almond Semolina Bread. That looks sooo good! Oh, my gosh...you've outdone yourself again!!! What a fabulous array of quick breads...I wouldn't know which one to pick first! 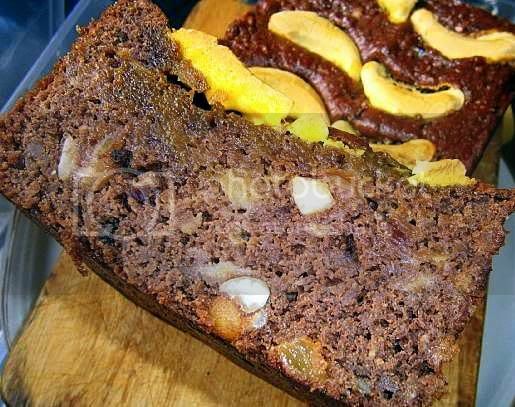 I love, love, love the details you added to your extra chocolate and plum quick breads. The wafers and plum toppers really take the bread up a notch. Wow! 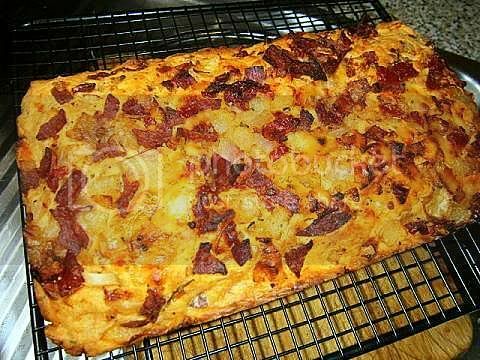 All I ever wanted to know about quick breads and more! Thanks for all the wonderful pictures and instructions. P.S. It's good to be back :D I've finally got around moving houses (new BIG kitchen :D) and having second baby - she's now only 2 months old and the other girl is only 20 months so... hands full! ;) Cheers! i LOVE your upside down plum loaf! the amazing color you got?! every month, your contribution to DB is just incredible! Oh my goodness Audax, as usual you have taken the cake. Well, actually taken the challenge to amazing heights! 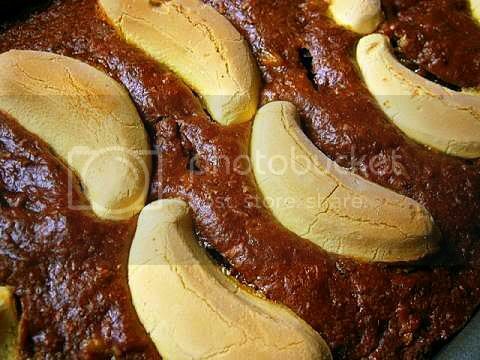 The tips on banana bread is very useful, I have to try the two bowl method, never liked the airier banana breads.